Thanksgiving, Christmas, and New Year holidays are around the corner. While no one wants to be ill at this time of year, the reality is, many of you will be. Unfortunately, the level of care you receive will likely suffer this time of year as well. Statistics show the worse patient outcomes occur during the holidays. That’s not to say, you can’t receive the care you need. Should you or a loved one need medical attention, the following information will help you make sound decisions and avoid the inherent risks of hospitalization during the holiday season. There are two lines of thought regarding this phenomena. One thought is patient-centered and the other is hospital-centered. 1. 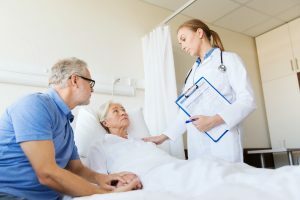 The patient-centered rationale proposes that people tend to have more serious illnesses during this time. Harsh winter conditions lead to more flu, colds and respiratory illnesses which in turn leads to a poor outcome among already fragile individuals. People may indulge in riskier behaviors that compromise their health, too. This might include smoking more, drinking alcohol to excess, or consuming too many rich, sweet, and fatty foods. Meanwhile, the emotional stressors of dysfunctional situations potentiate the likelihood of illness. 2. 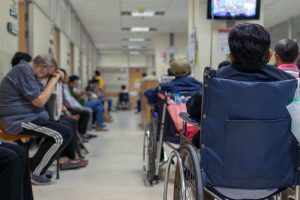 The hospital-centered rationale proposes that – even though they must remain open – hospitals slow down or shutter vital services during holidays. There are several reasons for this. Staffing during holidays is likely to be thinner. On top of that, hospital staff with the most seniority get to pick their vacation times first, and they are likely to choose the winter holidays. This leaves the less experienced staff stuck with the holiday schedule. Lighter, less experienced staff coverage can result in longer wait times and delays. Needed diagnostic testing such as a pathology report, a Cat scan, or an MRI may not be available during the holiday, leading to delays in diagnosis and appropriate treatment. Such a delay in a severe illness can have catastrophic consequences for the patient. Often too, social workers are not available on the weekend to facilitate an appropriate discharge. This leads to delays when transfer to a different level of care is needed. Being informed, asking the right questions, and advocating for the care you deserve, can ensure the safest possible hospital stay for you, or a loved one, during the holidays. Does the hospital rotate holiday coverage by employees to avoid staff burnout? Are senior-level physicians/nurses/respiratory therapists and other staff schedules during the holidays to balance out the less experienced staff that will be present. What is the hospital’s nurse or physician to patient ratio during a holiday? Does the hospital have articulated policies regarding how long a patient should wait for diagnostic testing such as a CT scan or MRI? What is the maximum amount of time planned for discharge or transfer to an alternative level of care? Keep a list of current medications with you. Patients admitted on the weekend or during the holidays deserve the same level and speed of care as patients admitted during the week. Lives literally depend on it. The NPUSA staff sincerely hopes that neither you, a family member, or a friend, are required to stay in a hospital during the holidays. But if the necessity arises, we hope the above information will help you to make sound decisions and avoid the inherent risks of hospitalization during the holiday season. Holiday in the hospital? Stay safe!